As timepieces director of Fabergé, Aurélie Picaud is finding new ways to entice the customer of today’s generation. Fabergé has a rich history of centuries of craftmanship and surprise. Traditionally known for its Imperial Eggs, it is a brand than many have heard of but often don’t know its true beauty and the story behind the brand. That is something Aurélie Picaud is trying to change. As Timepieces Director Picaud was given the challenge of telling this story in a modern way through the development of new watch collections. 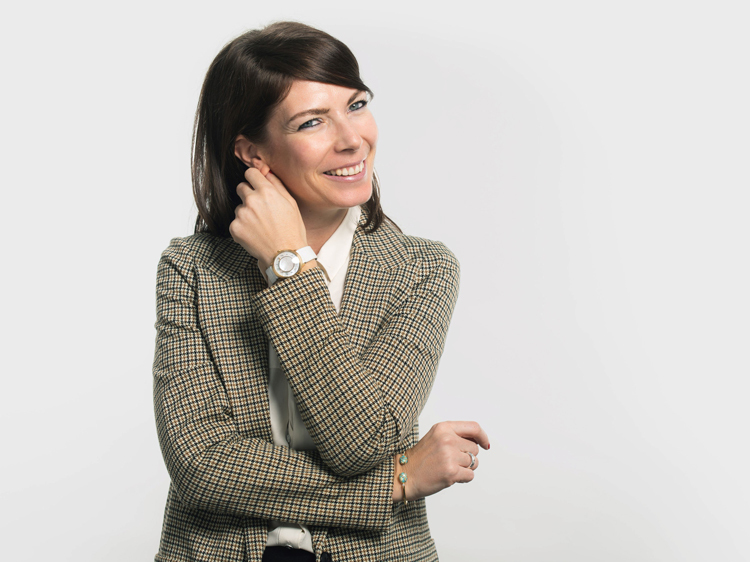 Since joining the brand in 2013 Picaud has strengthened Fabergé’s timepiece novelties and paved her way in a male-dominated industry to spearhead the development of five collections that have included revolutionary mechanisms and techniques. She handpicked a team from scratch to assist her and has since been pushing the boundaries of craftmanship to the next level. For Picaud the thing that makes Fabergé unique is the element of surprise, and that is something that was a key talking point when we met with her on a recent visit to Dubai. Fresh from opening the new Fabergé boutique in Dubai Mall, we got to talk to Picaud to find out what it is that makes these pieces so special. What can you tell us about your role within Fabergé? Everyone knows Fabergé for their eggs but what many people don’t know is that from 1917 the brand was also creating wristwatches and clocks that integrated a specific movement that told the time in a new way. They were already working with the best people in the industry at that time – Vacheron Constantin was there for the movement for example. In 1917 the Bolshevik Revolution happened and Fabergé was selling through different licences. It was then bought by Pallinghurst in 2007. In 2013 Faberge started looking for someone who would re-launch the watches sector internally. And that was me. When I came on board the brief was “we want to launch new watch collections in Basel in eighteen months”. So it was a big challenge! Very exciting but we had to be very organised and make sure we could do everything we wanted to do. The philosophy behind what we wanted to develop was to create new mechanical movements that were exclusive to Fabergé and told our story. Fabergé is of course about the highest level of craftmanship, but the difference between us and other brands is that we are about creating a surprise and an emotion. The same emotion that you have with the Imperial Eggs. We wanted to really replicate that through our watches. How do you think you’ve done that with the collections so far? 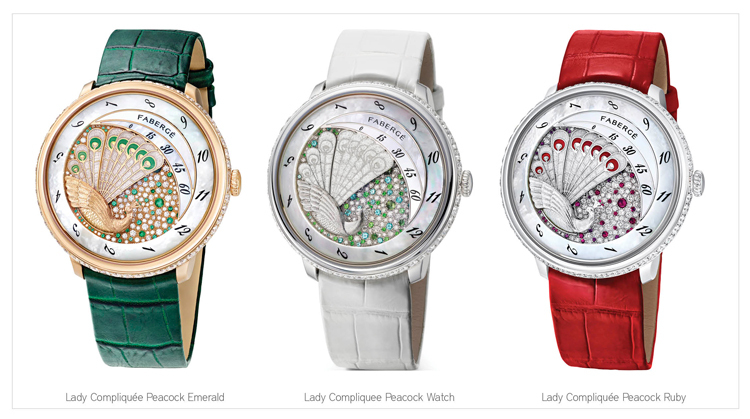 Lady Compliquée Peacock was the first watched we launched in 2015. As this was the first watch we were designing we had to decide who in the industry we would like to work with. I knew this watchmaker Agenhor, a movement manufacturer, and Jean-Marc Wiederrecht the front man of the company, is a great watchmaker who is famous for being able to translate the highest level of watchmaking into something that tells a story. So for Fabergé this was perfect. We didn’t intend to do everything internally because we know you can’t be the best at everything and at this time Fabergé was already working with masters. So we contacted Wiederrecht and explained how we wanted to develop a new movement unique to Fabergé which meant that every hour there is a surprise to be discovered in the dial. He got really excited by this. Then I told him it had to be ready in eighteen months and he told me I was crazy! But he still agreed to come on board. Looking into the archives we discovered a beautiful peacock egg. The feathers would open as the egg was manually winded. It was super impressive. So we came to the idea that we could replicate this within the watch. It’s really about telling the hours and the minutes in a completely new and unique way. And does this element of surprise run though all of the novelties? Yes it does. For the second collection we again took inspiration from the Fabergé archives. We discovered this beautiful Fabergé clock, which was very specific because the hands weren’t in the centre of the clock, only on the outside so there is a lot of creativity that you can have, particularly in the centre of the watch which, in this case, represents the centre of the egg and the surprise. So we were lucky enough to be able to develop a new mechanical movement with a completely new design. The clock that we found had a big “man in the moon” face in the centre and for the watch we took inspiration from this. When the watch catches the light you see the man’s face in the centre. So this is the element of surprise as only the wearer can see the face as if it is a secret just for them. These watches can be customised by clients as well so you can add a secret message inside with anything you want. Why do you think it’s so important to focus on the history of the brand? When you look at the Fabergé archive in terms of creativity it’s endless. I also think it’s so important to celebrate our roots and our values and to interpret these in a very contemporary way. So the aim is to tell the Fabergé story but in today’s world. What’s one thing that you still want to achieve at Fabergé? We have started establishing the collections but what I want to do is to continue surprising people. In the world of today this is not always easy because people have everything, so I want to really continue to make people dream and put a smile on the faces of those who are discovering our product. What challenges do you face in getting people to realise what Fabergé is doing in watchmaking? It’s true everyone knows Fabergé for the eggs. So I think the challenge is more in the educational process. Now that we have established the collection we need to start seeing our clients and retailers and telling them the story. When they hear this they will have the same feeling that we have so it really is important to be educating them in this. Everything has been directly inspired from the Imperial Eggs so it’s a case of making people understand what the story is. I think with digital becoming so present it is also a good opportunity for us to be able to tell the story to a new audience. Do you think storytelling is something that really adds to a brand in today’s society? Yes personally I really think so. Particularly for watches. I don’t think people really need a watch to tell the time today, so for me a luxury watch needs to be about something else. That’s why I think the story is so important. People love to know about what goes on behind the scenes. You mentioned how people don’t need a watch to tell the time today – how is that something that you overcome as a watchmaker? It has to become more poetic rather than anything. We aren’t competing with smart watches or anything like that we are offering something completely different and expressing our key values. People may not remember what you present to them but they will always remember the way you made them feel and that is exactly what we want to do. 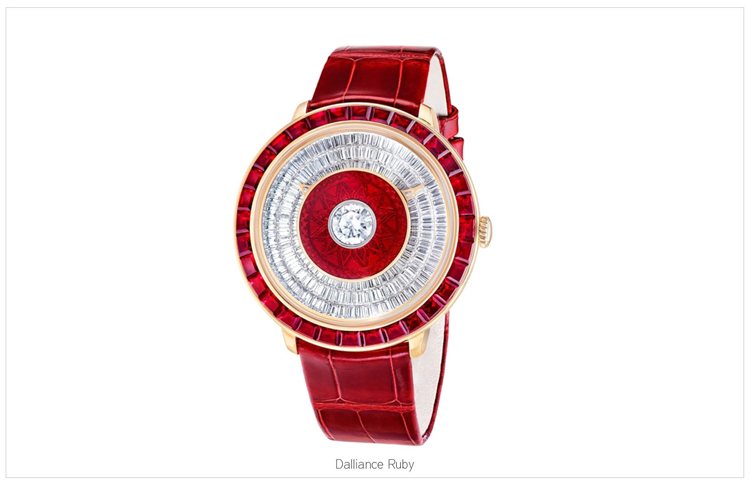 Who is the woman that wears a Fabergé watch? I would say she is very international, and a lover of art as our watches are more like works of art. She is someone who likes something very exclusive and wants something different that she can show and explain to people. What can you tell us about the stones that you use? Coloured gemstones are something that is really important to Fabergé. Even before 1917 Fabergé was always mixing together colours that did not necessarily go together, but in the final design looked beautiful. So we try to continue that. But also our mother company is Gemfields. Gemfields is the world leader in responsibly sourced coloured gemstones. So what is really key to us is knowing that all of our stones are sourced in the right way. I recently went to visit the mine in Zambia and I discovered the beauty of the rough emerald. Usually we only see polished ones but the rough one is for me so impressive because it’s very artistic and unique and different every time. So I decided to take this for one of the watch designs. We combined the image of Zambia from the sky (the rivers and green landscape) and we decided to mirror this shape with a rough emerald that was hand-carved. It was so challenging because the stone was so fragile but it is really amazing. Coloured gemstones are so important to us. With many of our watches the clients can choose the exact gemstones they want. This is one of our strengths – to really involve the client through the process. How important is sustainability to Fabergé? I think sustainability is something that today’s generation is more sensitive to and you have to be very sensitive to it as a luxury brand. Clients today expect that a luxury brand will do anything they can to be sustainable. From our side even from a human point of view, we work only with the watch masters and we have to know the conditions they are working in so there are no issues. On a materials point of view we work closely with our suppliers so that we are able to trace everything back through its entire chain. How important do you think it is to sustain craftsmanship? I think with a brand like Fabergé that is so exclusive and luxury, craftsmanship is something that we should really try to keep. The client loves it and wants to see and know the people that are working on the watches. There are some techniques that we use that are done in almost the same way they were done in 1917 and they have to be done by a human. Where it is more challenging is that sometimes the clients don’t understand the work that goes into something and they compare us with other brands who make watches in a much more industrial way, which they shouldn’t do because these brands are making thousands of watches. When you are more exclusive you really have to educate people to make them understand the skills that are behind these pieces. What is it that the customers in The Middle East love about Fabergé? Of course they love the gemstones. The people here are very educated in terms of craftsmanship and the setting of stones etc. We quite often do special limited edition pieces for The Middle East because people here like bigger watches that are really exclusive. We are able to be quite flexible and really offer something that is bespoke for the client. We recently opened the boutique which was a natural move for us. Our client is so international and so is Dubai so it really made sense. What can you tell us about your men’s offerings? 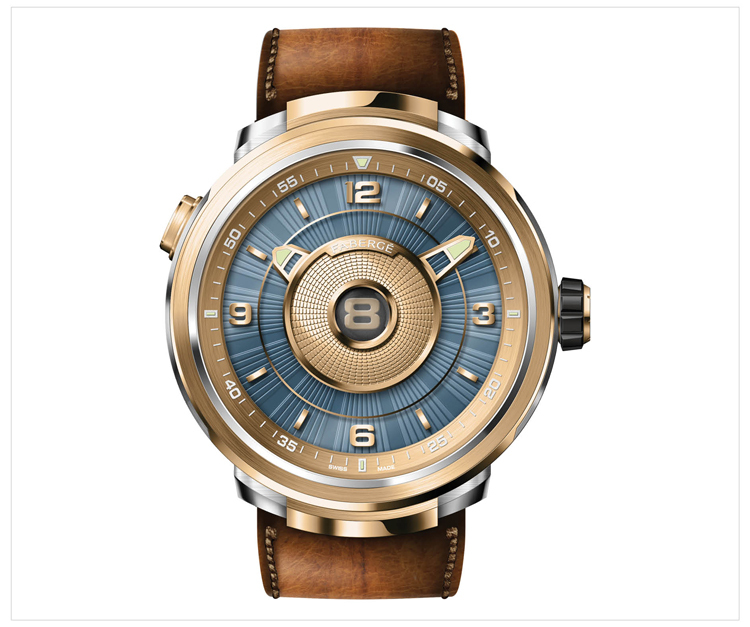 We are working on men’s watches in the same way to offer the element of surprise. With the men’s watches we are trying to offer surprises that are much more functional and technical. For example there is one watch that when you look in the right angle it will show you the time in a second time zone. It’s hidden within the watch so it’s a surprise for the wearer. We developed a completely new movement for this. We are actually aiming to not just have a 50/50 split on men’s and women’s watches but to go even further. I think we can say that there are less “men’s watches” or “women’s watches” today. We are very surprised that people can be attracted to any watch that doesn’t have to be specifically for men and women so this is something we are exploring more with our designs. What’s your favourite Fabergé piece of all time? My favourite piece is the Winter Egg. We actually have a watch that was directly inspired by this. It has the same mechanism as the peacock, but instead of having the wings opening it’s a frozen lake created in mother of pearl. The Winter Egg was made in 1913. It was very contemporary for the time, it was fully white with snowflakes and very well done. I love the story as it was made by a young designer who was a woman and for that time it was so unusual. How would you describe Fabergé in one word? One word is so hard! I would say artistry, colours and surprise. What’s the motto that you live your life by?